Tycho Brahe – Warrior Astrologomage! Man, I love this weird world we live on! Here’s an article on Tycho Brahe, a duelist, astronomer, mathematician (who says fighting-men have to be stupid) and minor nobleman who had a pet elk and dwarf jester who was supposedly clairvoyant (he made is psionic powers roll!). 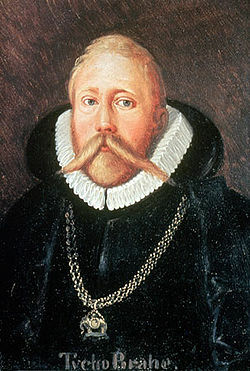 Oh, and Brahe had a prosthetic nose made of gold and silver because his own was sliced off in a duel that may have been precipitated by an argument over mathematics or astrology. Since I would like to believe that every earthbound weird-o from our glorious history has a free, all-access pass to live on in NOD after they slip their mortal coil, how about some game stats! Tycho Brahe, Fighting-Man Lvl 1, Magic-User Lvl 6*: HP 21; AC 9 ; Save 10 (8 vs. spells); CL/XP 6/400; Special: Spells (3rd). Rapier (1d6 damage), silver dagger, spellbook, prosthetic nose of silver and gold (worth 150 gp). Tycho’s Spellbook contains the following spells: 1st – Detect Magic, Light, Read Languages, Read Magic, Sleep; 2nd – Detect Evil, Detect Invisibility, Knock, Locate Object, Mirror Image, Strength; 3rd – Dispel Magic, Hold Person, Lightning Bolt, Suggestion. Jepp, Dwarf Assassin Lvl 4: HP 16; AC 8 ; Save 12 (11 vs. death & poison, 8 vs. magic); CL/XP 4/120; Special: Decipher script, disguise, sneak attack x2, skullduggery, poison, clairvoyance (3/day). Jester’s outfit and cap, pig bladder on a stick, three hidden daggers, vial of mercury (treat as slow poison – save or die in 1d4 days). Tycho’s Elk: HD 4 (19 hp); AC 6 ; Atk 1 gore (1d6); Move 15; Save 13; CL/XP 4/120; Special: None. Johannes Kepler, Magic-User Lvl 3: HP 7; AC 9 ; Save 13 (11 vs. spells); CL/XP 2/30; Special: Spells (2nd). Scholar’s robes, parchment and quills, horn of ink, vial of mercury (was it him or Jepp? Or both?). Johannes’ Spellbook: 1st – detect magic, light, read languages, read magic, shield; 2nd – continual light, levitate, phantasmal force. * Yeah, we could make him a sage, but where’s the fun in that. 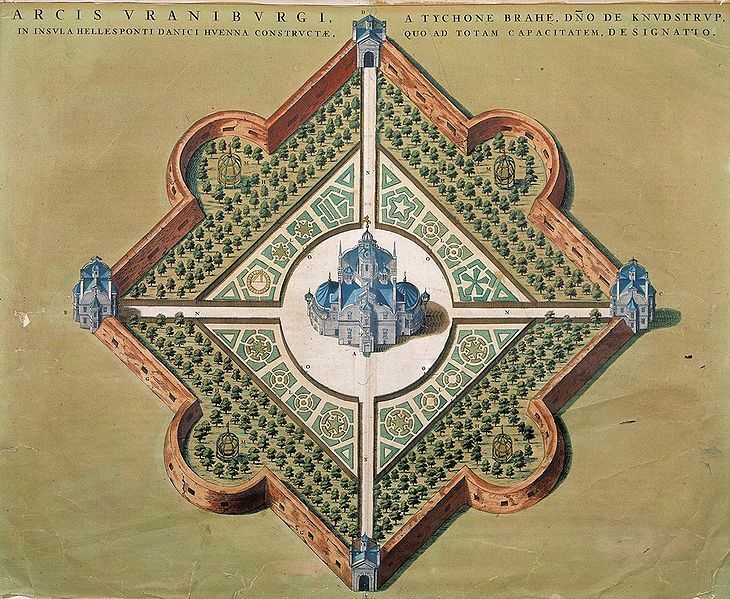 Below is pictured Uraniborg, Tycho’s stronghold. The gardens are planted with medicinal herbs and flowers. Each of the guard towers is guarded by 4 men-at-arms supplied by his royal patron, men wearing breastplates and armed with pole arms, daggers and light crossbows. A historico-fantastic menagerie of world hoppers for old school gaming – I like the idea of that. What–his prosthetic nose isn't magical? I.e., the solar system is ruled by d4, d6, d8, d12 and d20. Freak out! Yeah – I was going for Kepler being the apprentice of sorts to the older Tycho. Now I'm thinking cleric, what with the focus on God. And Trey – magical nose – how did I miss that. Time for an edit.